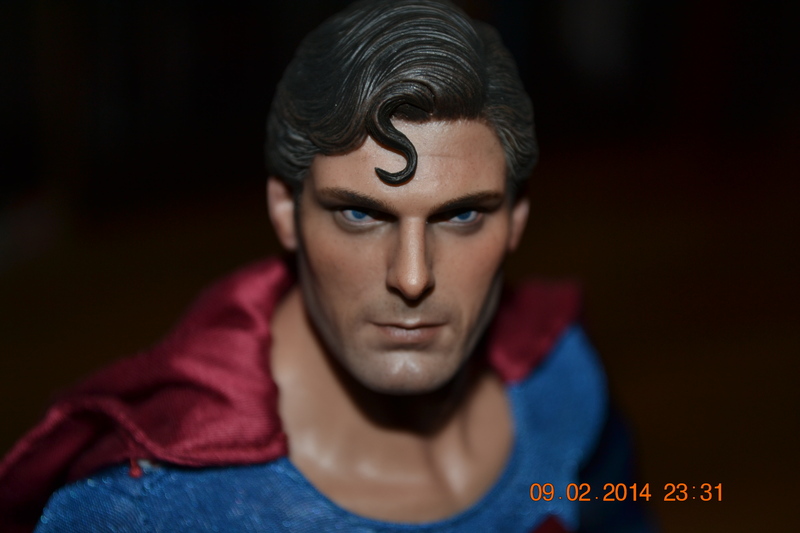 Hot Toys ‘Evil Superman’ from Superman III. Ok before I start, please excuse the carpet in some of the pictures. I was so excited to hold this magnificent piece that I just opened that bad boy out on the living room floor and started snapping away. This is just a stunningly detailed figure. Folks who know toys and collectibles, know that Hot Toys and Sideshow Collectibles are the absolute mac daddies when it comes to these items. Both companies employ sculpture artists of the highest order. Because they expect the best from their artists, they deliver the best to their customers. I was debating whether to go with a video review or pictures and text. I decided with the latter because firstly you don’t wanna hear me mumble through describing the awesomeness of this toy as it’s plain to see. Secondly my strengths lie in writing and hopefully taking pictures which compliment the toy itself. The toy comes in a massive box. First you have a lovely plastic sleeve which slips off the box. The box as a magnetised flap at the front which lets you look at this beauty behind plastic, should you decide to leave it in it’s box. Personally I couldn’t deny myself the pleasure of holding this in my hands. The stand it comes with is amazingly sturdy. 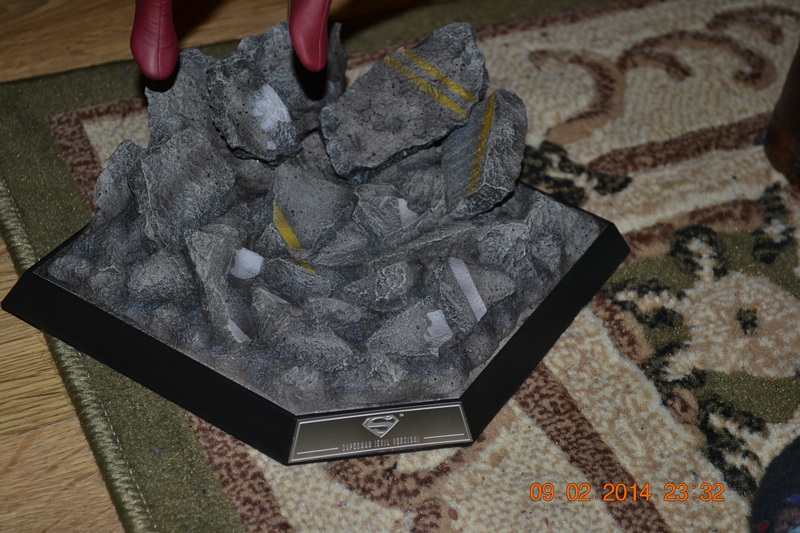 It’s done as crushed concrete which is almost something you’d expect to accompany an Iron Man toy. It’s all done with incredible detail however. There’s even a nice little silver sign at the front of it which tells you it’s Superman. 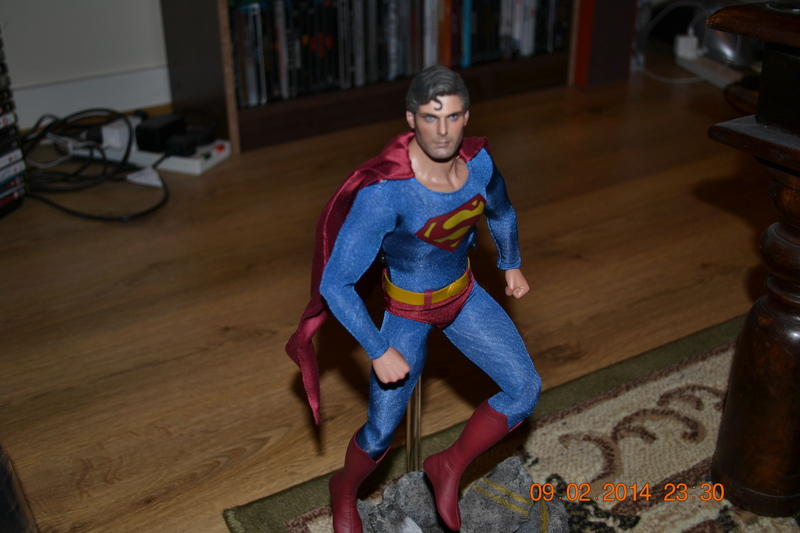 You get a plastic pole and clamp which is used to hold Superman in a flying position or hovering position. You also get two extra sets of hands (open palm and slighly open), plus two extra clips for the hands. The quality of Superman’s costume and cape is amazing. It’s soft to the touch but captures every detail perfectly. 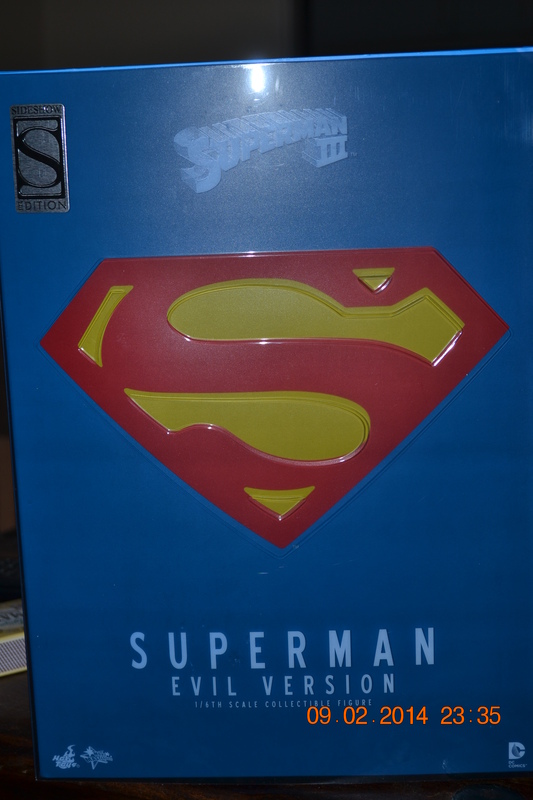 As it’s the Evil Superman from the movie Superman III, his cape and costume are a darker shade of red and blue. He also has a slight 5 0’clock shadow adorning his face, to really drive home his evilness. 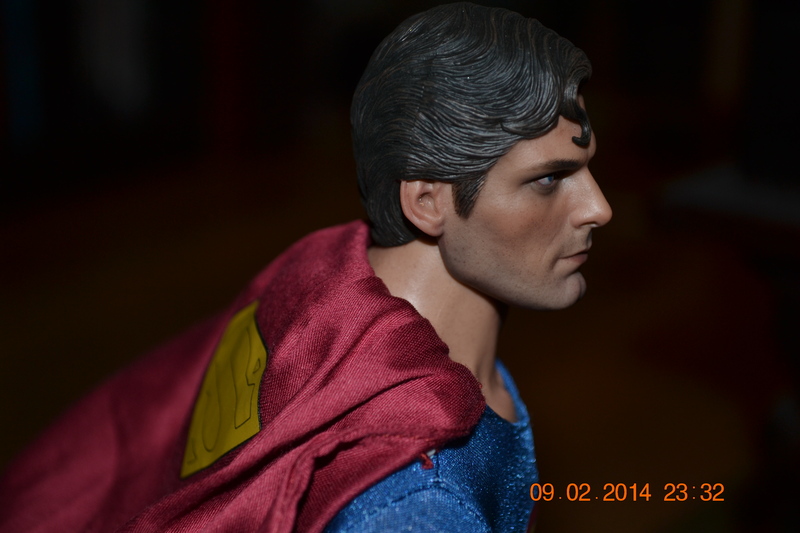 The likeness to Christopher Reeve is uncanny. The artists at Hot Toys have captured it perfectly. This really is the closest you’ll get to the brilliance that was Reeve as Superman. My buddy suggested that I rotate Superman every week from flying to standing and so on. Mainly because I just can’t decide what I want Superman to be doing. This truly is a work of art. Some folk like going to museums to look at paintings. I however can sit and stare at this all day. Studying every detail and nuance it displays. 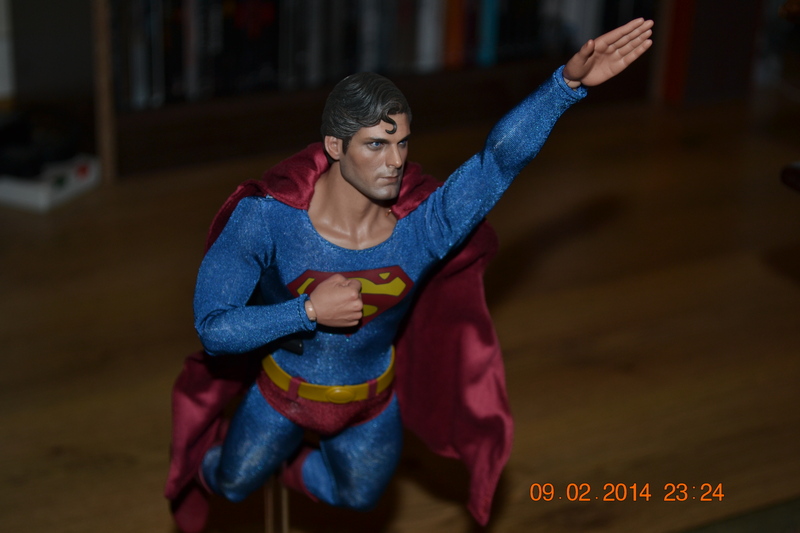 If you are a Superman fan, Hot Toys fan or Sideshow Collectible fan then you owe it to yourself to seek this figure down and give it pride of place upon your mantle. It truly is a remarkable display in artistry. 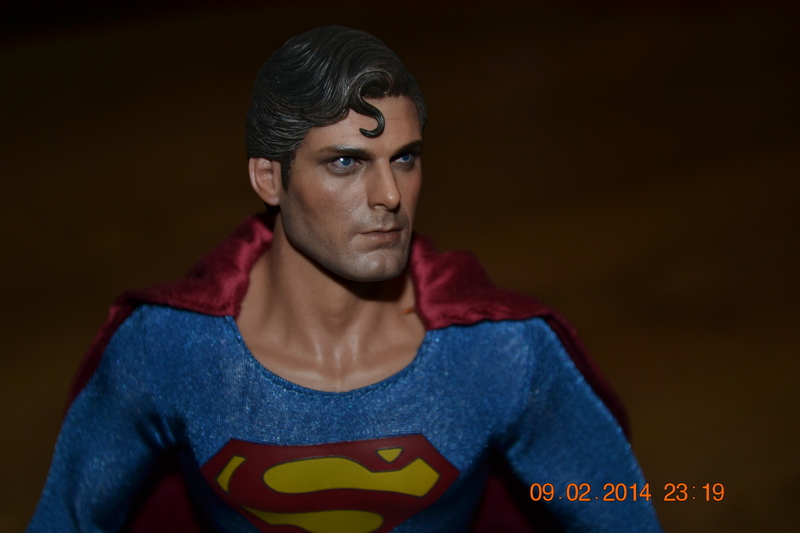 This Evil Superman toy was graciously provided by the fine folk over at Sideshow Collectibles. Should you want to pick one up for yourself, then head straight over to http://www.sideshowtoy.com and get one while stocks last. No “Good” Clark? If they could do the burnt jacket, that would look awesome. How brilliantly done was that fight in Superman III?